3D? No thanks. Asus' latest G series bids gaming in 17 and 15 inch formats. Complementary to the previously reviewed G53 with a 3D display, we now add a review for the alternately available Full-HD display. According to the observed trends at the IFA in Berlin this year, 3D is the order of the day. In fact you have to look hard in the manufacturers' product lines until you find something. In opposition to the netbook trend, or the current tablet hype, 3D apparently doesn't really want to come to the fore in notebooks. Even if the manufacturers deny it, this observation of the current ranges speaks for itself. Subsequent to the review of the compact Asus G53JW gaming machine with a GTX 460M graphics card and HD 3D display, we now provide a review of a practically identically equipped model. It may present a more interesting alternative for Blu-Ray and gaming fans. Details about the identical case, interfaces and input devices, as well as performance can be found in our previous review of the Asus G53JW with a 3D display. We will start with the focus of this review: the Full-HD display. To be precise, it is an AU Optronics screen with the model name, AUO15ED. Beside the lack of a 3D function (120Hz), especially the considerably higher resolution of 1920x1080 pixels is a significant difference in comparison to Asus G53JW 3D alternative, which only had a resolution of 1366x768 pixels. Our previous gaming test have proved that Nvidia's GTX 460M graphics card installed in the device is well able to display current games smoothly even in higher resolutions and attractive detail level. You can find detailed information about this in our game list. Thus, the user not only can take delight in a finer resolved image in games, he will also notice the advantage of a significantly more clearly arranged desktop. Multitasking with several open windows is now possible without ado. Last but not least, even Full-HD content of Blu-Ray disks in the native resolution can be enjoyed. A razor sharp and particularly high detail image is conjured on the screen. All in all, a few weighty arguments that make taking this alternative appear very tempting. But, what do the assessed rates of the applied hardware look like? Our Gossen Mavo Monitor measures a maximum of 240 cd/m2 in the lower center display area. This is marginally higher than in the 3D alternative (223 cd/m2). The Full-HD alternative is also slightly more convincing than the 3D screen in terms of illumination. The brightness decreases to a maximum of 196 cd/m2. Thus, the brightness distribution is good 83% (3D: 77%). The just gained bonus points are unfortunately destroyed quickly in regards to the maximum display contrast. The display only achieves a maximum contrast ratio of 166:1 in maximum brightness and relatively high black value of 1.37 cd/m2 - a rather disappointing rate. The G53JW's 3D alternative could still bestow a satisfactory 272:1 to this ranking. Another point for assessing the installed display's quality is the range of the reproducible color spectrum. We don't recognize big differences in a direct comparison of the 3D display and the Full-HD screen at hand. Although a slight deviation in the color spectrum is apparent, the high resolution display is in the same category. Nevertheless, a slightly larger color space can be covered in comparison to displays in budget entry level devices. Thus, both G53JW display alternatives come close to covering the SRGB color spectrum. At this point, we usually elicit a possible outdoor use of the test device. Although the G53JW would be suitable for this because of its 15 inch size, a mobile use is extremely impaired due to its high total weight of about four kilograms plus almost one kilogram for the adapter. Additionally, the reflective display surface also isn't exactly beneficial in this regard. We could already determine unpleasant reflection indoors in bright ambient light conditions. The Full-HD display doesn't earn any kudos for the given stable viewing angles, either. The viewing angle stability is sufficient for stationary use. However, if you only deviate moderately from the ideal perpendicular viewing angle, image distortions turn up quickly. Overall, we would consider the given stability even below that of the 3D display. The 3D model we tested, configured with Intel's Core i7-720QM CPU and Nvidia's GTX 460M graphics card, proved to be equipped slightly inferior to the G53JW versions found in retail. The Intel 740QM CPU is installed in the Full-HD sample at hand. It promises a performance increase of up to 10% in comparison to the 720QM predecessor in CPU dependent calculations. The advantages of the CPU refresh even turn out lower in gaming because the GPU usually develops to a limiting factor when the detail level is increased. Details about this can also be found in our special review about the Clarksfield CPU range refresh. We checked the performance of the device at hand with a few benchmarks. The present test system could score 12584 points in Futurmark's 3DMark 2006 (1280x1024). This is a plus of only just 3.5 percent in comparison to the tested 3D alternative with a 720QM. The sample at our disposal reaches a total of 7400 points in the latest 3DMark Vantage. Even if this is trivially more than the 3D device was able to reach (7383 points), the benefit of a higher clocked CPU diminishes to an insignificant 0.23%. For this reason, we can refer to the determined benchmarks in the review of the G53JW with a 3D display and 720QM CPU, without having to expect major deviations. Further information about the Nvidia GeForce GTX 460M's gaming performance can also be found in our our gaming list. We could however observe a clear increase in PCMark Vantage. Thus, the configuration at hand achieved a very good total score of 6715 points. 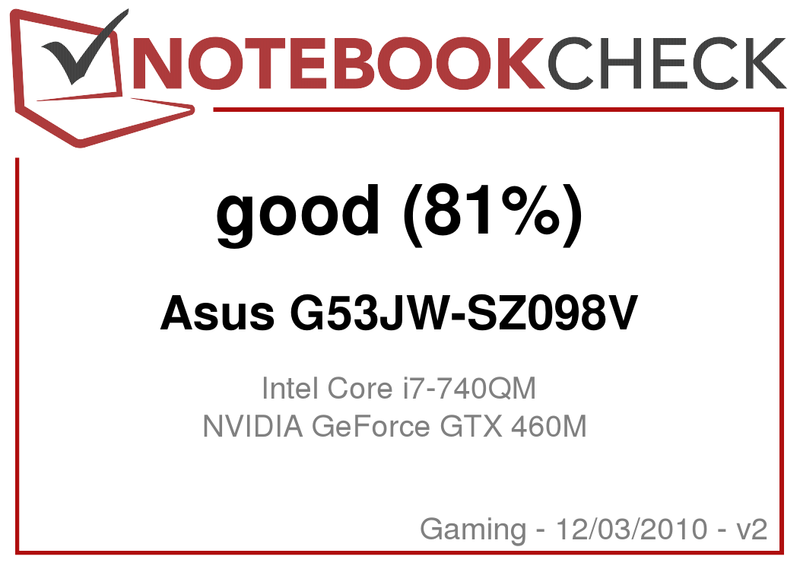 The tested Asus G53JW 3D alternative could "only" score 5570 points. This represents a plus of over 20%. This performance increase can't solely be explained by the higher clocked CPU. Therefore, we examined PCMark Vantage's single results more closely. In fact, an above-average good result of 7655 points was noticed. This ultimately revealed the utilized Seagate Momentus XT ST95005620AS to be a hybrid drive. That is a combination of SSD (solid state drive) and a conventional magnetic disk memory. Advantage: Frequently accessed data can be supplied faster. Generally, a large total memory capacity (500 GB) can also be offered at an attractive price. We could observe an interesting fact in the course of our test of the updated Full-HD version: The noise emissions stay even behind the agreeable rates of the reviewed G53JW 3D alternative. For example, we could only measure a low noise level of 32.7 dB(A) in operation without load (idle). The fan ran on its lowest level and the HDD was also active here. When the HDD deactivates itself, the system noise even sinks to merely 30.8 dB(A). If you consider that this is an extremely strong gamer with a quad core CPU, this result is even more surprising. The Asus G53J can also display its biggest advantage under load: The fan only reaches a level of merely 35.8 dB(A) in the 3DMark 2006 benchmark, as well as in many new games, and pleasantly remains absolutely inconspicuous in the background. We could even still extract an absolutely unproblematic maximum volume of 43.4 dB(A) from the notebook even in the stress test (CPU and GPU load with Furmark and Prime95). Excellent. As many times before, we recorded the notebook's surface temperature in various operating modes. The result: Hardly any changes in idle mode, a slightly higher temperature under load. While the case can almost still be described as cool with a maximum of slightly more than 30°C in idle and undemanding office use, the G53JW reaches a maximum of 48.5°C in the case's rear bottom area. This rate is about 5°C higher than in the 3D alternative. However, it is still alright for a gaming notebook with the according equipment, especially since the base unit's top only heats up to 37°C even in the stress test and wrist-rest stay pleasantly cool with just only 27°C. A look at the temperatures inside show a maximum rate of 86°C for the CPU and 85°C for the GPU. Both rates are absolutely in an uncritical, green range. Throttling in the stress test (reduction of CPU or GPU clock rate) couldn't be observed. (±) The average temperature for the upper side under maximal load is 32.4 °C / 90 F, compared to the average of 32.9 °C / 91 F for the devices in the class Gaming. (+) The maximum temperature on the upper side is 37.5 °C / 100 F, compared to the average of 39.3 °C / 103 F, ranging from 21.6 to 68.8 °C for the class Gaming. (+) In idle usage, the average temperature for the upper side is 28.6 °C / 83 F, compared to the device average of 32.9 °C / 91 F.
We could measure a power consumption of 28.4 to 39.6 W on our test model during operation without load. This is a slightly lower rate in comparison to the reviewed 3D version. However, it is interesting that the energy requirement of the alternative at hand is considerably lower than that of the 3D counterpart. We couldn't determine a concrete reason for this. Ultimately, we can link up to the reviewed 3D G53JW version. 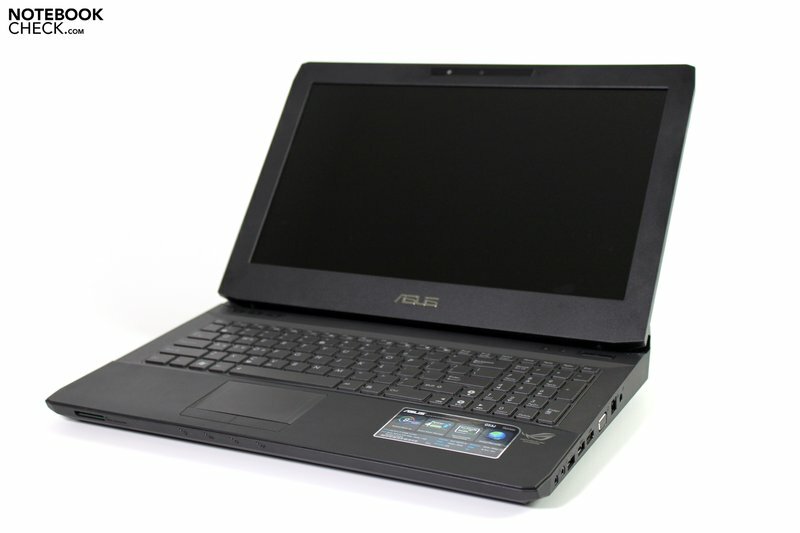 Asus probably provides one of the currently most attractive gaming notebooks with the device at hand. The design is right, the performance can cope with even new games and notebook's the low emissions likely provide the competitors with a mind-baffling riddle - almost silent in office mode and even below the one or other office notebook's idle level under heavy gaming load. This proves the successfully implemented concept of the Asus' engineers. If you take the 3D alternative or a standard screen is dependent on personal preferences. The Full-HD display in the test device unfortunately wasn't really convincing. This was mainly due to the slip-up in display contrast. The moderate viewing angles don't give much reason for rejoicing, either. Nevertheless, there is no way around this solution if you take advantage of a high resolution, and also use it with e.g. Blu-Ray disks. It gets complicated if the reviewed alternative interests you and you start looking around for a supplier. Currently, a few shops and price comparison sites list the tested version (SZ098V) with a HD display (1366x768 pixels), while Asus has this model as a Full-HD alternative on its price list. The notebook can be purchased for slightly less than 1500 euro in various online shops. Full-HD instead of 3D. 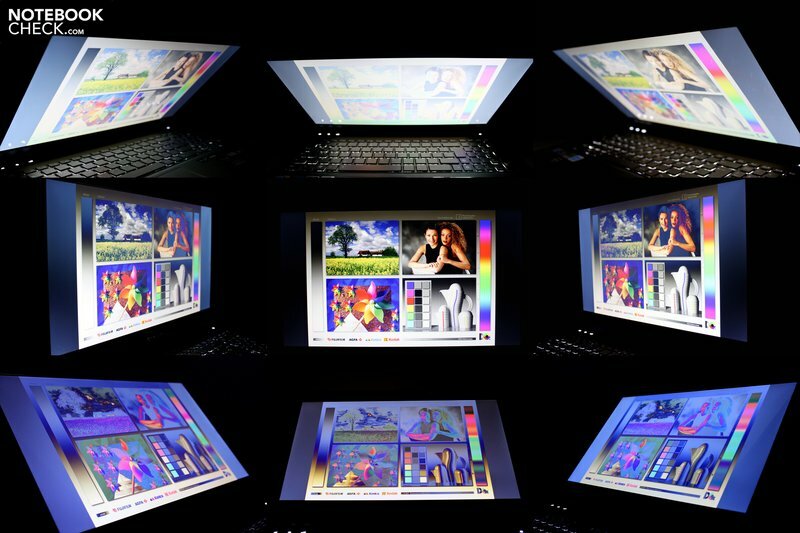 The benefits of a high resolution outweigh a lower resolution 3D display in comparison. A bit more courage for researching data stated in single shops that incorrectly list the reviewed SZ098V alternative with a 1366x768 pixel HD display. The slip-up with the maximum display contrast wasn't really necessary. The similarly constructed G53JW with a 3D display or the larger Asus G73JW with the same equipment. Toshiba also has a GTX 460M gamer, the Qosmio X500, however in an oversized 18 inch case. More compact solutions are also found in Schenker's XMG P500 notebook or Medion's X8611/12.